If you read this blog, you know how I feel about kale; it is just a little too bitter and earthy for me. But considering that it is s a nutritional powerhouse filled with fiber, calcium, antioxidants, iron, and other minerals, I figure out ways to incorporate it. I blanch it in dishes like my potato-apple-kale sauté or in pasta with caramelized shallots and kale which takes the edge off. But, raw, not so much. And, here is why. I recently read an article about supertasters, people who are hypersensitive to the bitterness in certain foods, kale being a prime example. Finally, an explanation! So I came up with this salad and dressing which is influenced by three of my friends: Rachel, Amy and Kim. The creamy avocado dressing, combined with the sweetness of raisins, the sharpness of scallions, and the kick of the lemon juice, makes for a delicious salad. Yeah! Place all ingredients into the food processor and combine until smooth. Add more water if too thick. Take the kale off the center rib and chop it finely. Thinly slice the scallions. Toast the pine nuts. Place everything into a big bowl including the raisins. Toss with as much dressing as you like. Enjoy! Awesome salad! I learned to break down raw kale by massaging it by hand with salt and letting it sit and macerate. It mellows it out. You might want to try if you haven’t. i’m not into massaging kale but i hear it works! 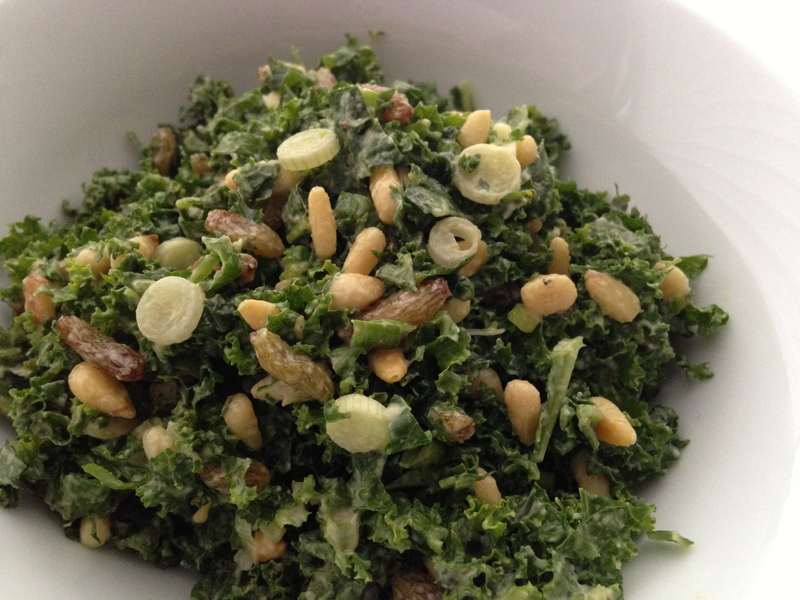 this is my solution to delicious raw kale for salad.